An imperator is, of course, someone who pretends to be someone else. And Julius Caesar pretended to be an emperor better than anyone in history. In fact, there were thousands of statues and images of him all across Rome. He sure fooled a lot of people. (editor's note: Imperator is the Roman word for Emperor. Julius Caesar actually was Emperor of Rome. Please humor our writer. He tries hard). 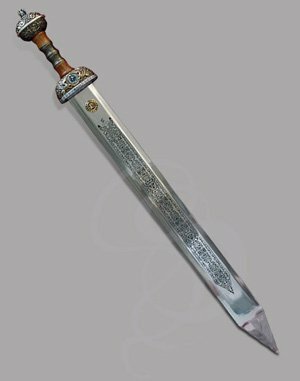 There is little of this sword that is not engraved or otherwise highly decorated. The rich, laquered and waisted grip is anchored by a series of etched metal rings at the center, each carved with elaborate patterns. The pommel features grandiose ivy patterns and regal images of Caesar and his confidantes. 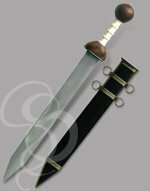 This is one of the finest display swords we sell, and would make a fantastic gift for any Roman hitory buff or fan of Julius Caesar. Heck, it would make a great gift for just about anyone. Oh, and think of what a great award it would make for recognition in the workplace! The possibilities are endless, but know this... I really really want one, so if you buy one, could you please get a second for me? I think I get a discount for working for Strongblade, so the second one wouldn't cost that much. Please? Pleeeeease? Materials: Blade: Polished Stainless Steel. Grip: Wood and Steel. Pommel: Carved Steel. Note: This sword does not include a sheath.